A highly critical vulnerability has been discovered in the Cisco Systems’ WebEx browser extension for Chrome and Firefox, for the second time in this year, which could allow attackers to remotely execute malicious code on a victim's computer. Cisco WebEx is a popular communication tool for online events, including meetings, webinars and video conferences that help users connect and collaborate with colleagues around the world. The extension has roughly 20 million active users. 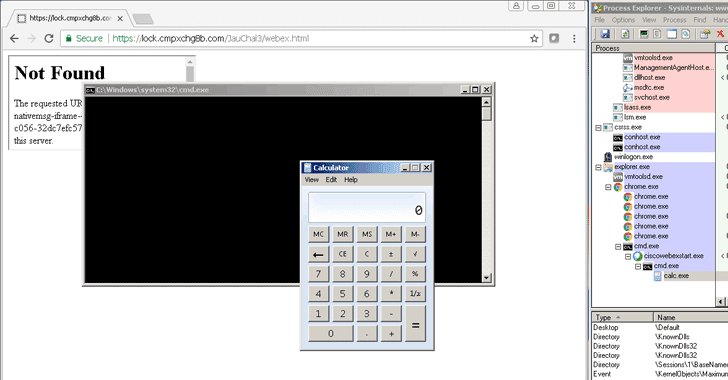 Discovered by Tavis Ormandy of Google Project Zero and Cris Neckar of Divergent Security, the remote code execution flaw (CVE-2017-6753) is due to a designing defect in the WebEx browser extension. To exploit the vulnerability, all an attacker need to do is trick victims into visiting a web page containing specially crafted malicious code through the browser with affected extension installed. Successful exploitation of this vulnerability could result in the attacker executing arbitrary code with the privileges of the affected browser and gaining control of the affected system. "I see several problems with the way sanitization works, and have produced a remote code execution exploit to demonstrate them," Ormandy said. "This extension has over 20M [million] active Chrome users alone, FireFox and other browsers are likely to be affected as well." Cisco has already patched the vulnerability and released “Cisco WebEx Extension 1.0.12” update for Chrome and Firefox browsers that address this issue, though "there are no workarounds that address this vulnerability." "This vulnerability affects the browser extensions for Cisco WebEx Meetings Server, Cisco WebEx Centers (Meeting Center, Event Center, Training Center, and Support Center), and Cisco WebEx Meetings when they are running on Microsoft Windows," Cisco confirmed in an advisory released today. In general, users are always recommended to run all software as a non-privileged user in an effort to diminish the effects of a successful attack. Fortunately, Apple's Safari, Microsoft's Internet Explorer and Microsoft's Edge are not affected by this vulnerability. Cisco WebEx Productivity Tools, Cisco WebEx browser extensions for Mac or Linux, and Cisco WebEx on Microsoft Edge or Internet Explorer are not affected by the vulnerability, the company confirmed. The remote code execution vulnerability in Cisco WebEx extension has been discovered second time in this year. Ormandy alerted the networking giant to an RCE flaw in the WebEx browser extension earlier this year as well, which even led to Google and Mozilla temporarily removing the add-on from their stores.